It’s long overdue, but the folks at the BBC have finally got around to spreading the love Android’s way with the release of their BBC News for Android app. The iOS version of the app has already bagged no less than six million downloads by iPhone and iPad users after being released in July 2010. Of that total, half of all downloads were from the UK, so there’s surely a lot of mobile-toting Brits feeling the love for the Beeb. The BBC News Android app is available on all Android phones and tablets running software versions 1.6 and above, but we’re not yet supporting Honeycomb tablets (Android software version 3.0). The app’s video experience is accessible to both Flash and non-Flash enabled devices, over wi-fi and 3G connections. In-story video is supported on Android devices versions 1.6 and above, and live streaming of the BBC News channel is possible on versions 2.2 and above which run Flash. The 580k download lets users personalise their news by adding or removing categories, and there’s also the inevitable sharing tools onboard, plus a natty breaking news ticker. It’s a delightfully slick app and it seems churlish to complain about a freebie, but users running out of space on their phones won’t be pleased to note that the app can’t be installed to the SD card. Sort it out BBC! 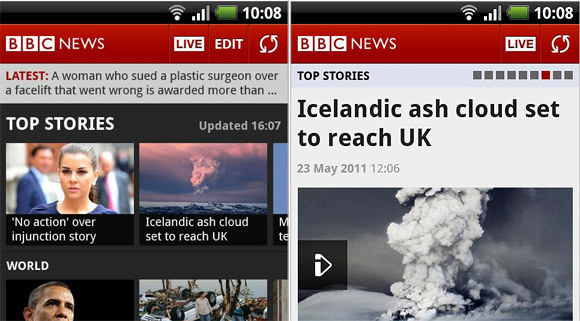 You can download the BBC News for Android app on the Android Market. We love it.